After working at a company for nine months, a manager complained bitterly about the organization and his colleagues. He believed he was brought into the company to bring about needed change. His expertise would clearly benefit the company with their changing market demands and increased competition. He knew what the company should do. There was one problem. People were not open to his ideas or even to him for that matter. Of course, many experienced hires have a similar onboarding experience. The newly hired expert has a paradigm of how things “should be” and comes across as negative and not understanding. The experienced hire begins to feel anxious because he or she wants to demonstrate value. The challenge this manager had is that his solutions seemed so obvious to him. After all, they worked at his previous employer and he was an expert. However, rather than influencing his new colleagues, he blamed them for not listening or adopting his solutions. Not surprisingly, the blame did not endear him to his new colleagues and complaints about him grew. Eventually, HR suggested he work with a coach. It is human nature to blame others. We naturally feel like the “good guy” or the innocent victim. It feels good to “be right” and we are supported when others agree that we are right. However, the cost of staying in this stance can be high. Many new hires don’t make it in their new companies or they continue to feel alone and as if they are fighting an uphill battle. I am reminded of the saying that when we are pointing a finger to blame the other person that more fingers are pointing toward us. You may also recall the parable of a man in a boat who demanded that an oncoming boat change course. The other boat kept heading right toward him and eventually hit him. He was furious. Then he realized that the boat did not have a navigator and must have broken free and was floating down the river. We can only try to manage or change ourselves. The blaming takes a lot of energy that is diverted from the business problem we are eager to solve. How do we manage our instinct to blame? First, we need to get empathy and understanding from a caring friend or coach and also give ourselves compassion. It really is difficult to come into an organization with new ideas. It is also stressful to feel you need to prove yourself quickly. It is upsetting to see results slip when you sense you could make a difference. You paid a high cost to move to a new organization and you and your family are counting on being successful. It is frustrating to feel blocked out of conversations. You’re disappointed that behaviors that were appreciated in your previous organizations are not recognized at the new organization. You don’t feel valued. Don’t underestimate the importance of empathy and self-compassion. It is not easy to join a new organization and introduce change for anyone. Choose to want success and connection more than being “right.” Assume that people have good intentions and are doing the best they can. Work to notice when you are blaming and focus on learning. That’s right. Look for what you can learn and be humble. It will take multiple times to shift from judgment to being open-minded. It is a great muscle to develop and use this experience to build the muscle. It will serve you in multiple areas of your life. When we get trapped in the victim mentality we need to jump out of the cycle to change the dynamics. Then, you need to work to understand and give empathy to your new colleagues. When we are able to calm down and see different perspectives, we can often see a mistake we made or are continuing to make. Each culture is different and it is hard to interpret some of the unwritten rules. Upon reflection, this manager realized that he had publicly doubted a colleague’s solution. This kind of action was expected and rewarded in his previous organization. No wonder this important peer did not share information now and be open to his ideas. With understanding, small changes can make a difference. When my client was able to shift from blaming to understanding, he was much more acceptable to his colleagues. He began engaging in meaningful conversations. He experienced more ease and he was able to share his views and build a solution with his colleagues that gained market share for the organization. Over time, he gained a positive reputation as someone who was emotionally intelligent and a team player. 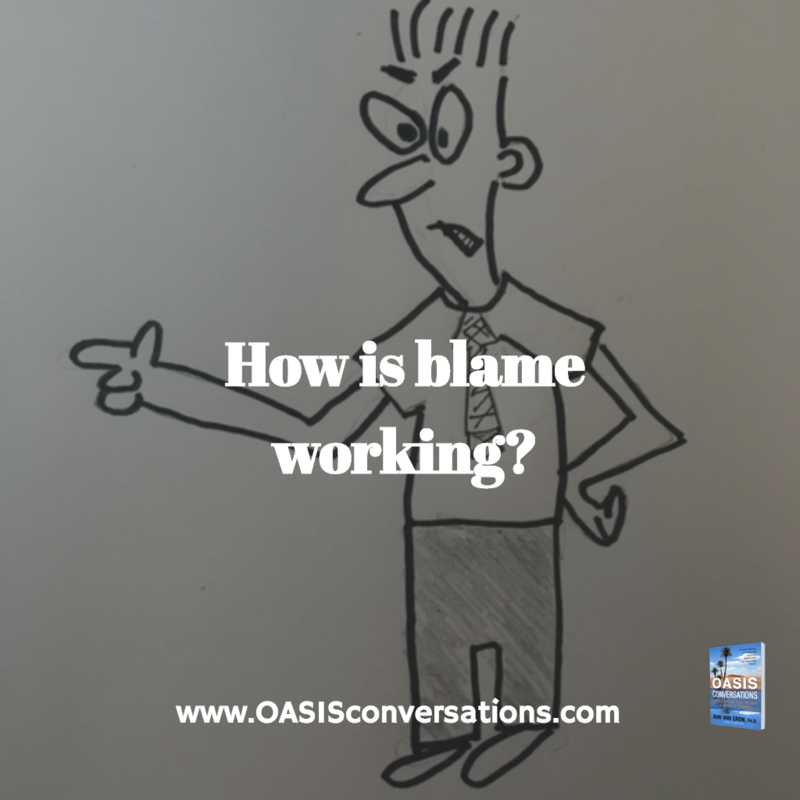 Where are you frustrated and blaming others? What has supported you in shifting to being open-minded? This entry was posted in Communication, Mindfulness, Mindset, Perspective by Ann Van Eron. Bookmark the permalink.